Despite only 12 people being present at the May coffee morning, it was a really good event – much hilarity and a wonderful atmosphere. Everyone was chatting merrily, and we all sat together in a huddle so as not to miss any of the conversations. Unfortunately there is no picture of the event this time as Sue forgot her camera. Julia took hers but the battery was flat! 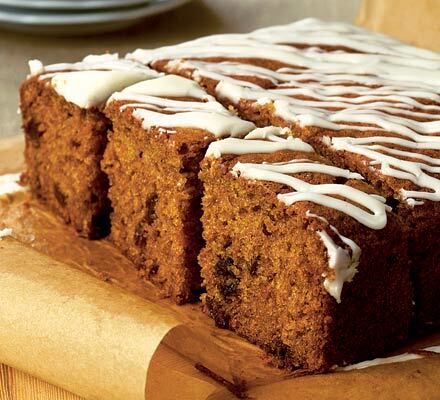 However, we do have a recipe for the Yummy Scrummy Carrot Cake that was so popular (only one slice left at the end!). This cake is light and moist and keeps for up to a week in a tin. 1. Preheat the oven to 180 C / Gas 4 / fan 160 C. Oil and line the base and sides of an 18cm/7″ square cake tin. 2. Tip the sugar into a large mixing bowl, pour in the oil and add the eggs. Lightly mix, then stir in the grated carrots, raisins and orange rind. 3. Mix the flour, soda and spices, then sift into the bowl. Lightly mix all the ingredients. 4. Pour the mixture into the prepared tin and bake for 40-45 minutes, until it feels firm and springy when you press it in the centre. 5. Cool in the tin for 5 minutes, then turn it out, peel off the paper and cool on a wire rack. 6. Beat together the frosting ingredients in a small bowl until smooth. Set the cake on a serving plate and drizzle the icing over the top, then cut into slices.